We have been designing and building water filters that combine premium filtration media with a unique magnetic and far-infrared volcanic mineral process since 1999. We go beyond filtered water, which is why we call our process ‘water energisation’. It produces a class of water quite different from the usual filtered or bottled water you might be used to. After all, its not often you see a water filter attracting health professional endorsements. Besides being incredibly healthy, our water energising process actually makes water ‘wetter’. In fact, our water is up to twice as hydrating as ordinary water and once experienced, you will never want to be without it. So, how did we end up creating a filter that is completely different to every other water filter on the planet? While we officially started in 1999 we have actually been working with water and ‘energisation’ technologies in one form or another since the mid-1980’s. We studied the published and private papers of leading scientists from years gone by. People like Johannes Kepler and Victor Schauberger, the father of vortex flow forms. We also followed the work of leading edge scientists of today who proposed that water has the ability to store memory that is related to its hydrogen bonding structure. The key was research suggesting that the water inside living cells was completely different, in a structural sense, to the water outside the cell. This led us to an entirely new understanding of water and its relationship to good health. When we looked at the water filter market we saw that no-one was addressing the most important aspects of filtration – water memory, energetics and structure. So, we set out to find or create a filter that would create perfect cellular water. The very first filter to use our unique volcanic mineral process was released in Japan way back in 1985. Called the ‘Naturalizer’ it was developed to help improve the athletic performance of the Japanese Olympic Swimming team. The water it produced ended up being so unique it was quickly adopted by tens of thousands of consumers, healthcare professionals and the Japanese Ministry of Health as an aid in the prevention and treatment of a broad range of health-related conditions. In 1999, we formed a joint venture to bring the benefits of this amazing volcanic mineral filtration process to the rest of the world. After several years and thousands of filters installed, we set out in 2008 to concentrate on new breakthroughs that were being made into structured water research while seeking to improve the filtration performance of our filters for the wider international market. 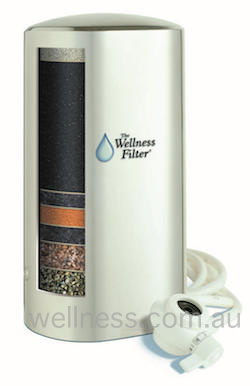 After several more years of research we released the ‘LivingWater’ Series 5 multi-stage drinking water filter in 2010. This new unit offers higher levels of filtration quality together with improved water energetics. In 2012, we introduced the Ultimate Defender, bringing energised water to the home for drinking and bathing, and the Series 5 to produce remineralised, re-energised fluoride free drinking water. In 2015 we expanded to a regional base located in Singapore where we offer customised filtration systems for the rapidly growing Asian market. These high-end systems (POA) comprise multi-stage filtration for high volume users from 3,000 to 10,000 litres per day. After the success of the the Wellness Filter throughout the rest of the world Wellness Water UK was launched in 2018 supplying the UK and Europe with the Wellness Series 5 and Defender Ranges. Because our approach to water filtration is based on science and natural principles, we have been able to avoid passing fads such as water ionizers and high pH, alkaline water. We focus on using only natural solutions to produce perfect water.